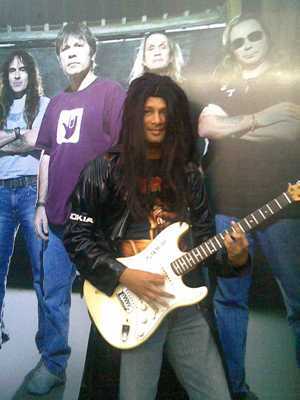 Iron Maiden in Bangalore… I was there! As usual, “Why not Mumbai?” is the frustrating question that we ask ourselves whenever we hear of concerts in Bangalore, and we know the standard list of answers and we know the solution too, someday maybe…? Saturday, March 17, 2007, 11:00 am – We land in Bangalore and head to Jatin’s place, a nice and cozy home in a quiet area called Cox Town (I had met up with my school friend Jatin over some beer where amongst other things he suggested that we put up at his place in Bangalore). Saturday, March 17, 2007, 6:00 pm – After a much needed afternoon siesta, we head to the Palace Grounds. The guest band Parikrama (the lucky ones eh?) is performing and the crowd is gathering. The next performance is by rock vocalist Lauren Harris, the daughter of Steve Harris. The guitarist is monotonous but pretty good with what he is doing. The vocals, well… better left unsaid. It’s getting darker and the crowds are still pouring in. We park ourselves at a place near the centre of the ground to the left of the sound console. The view looks good and the sound too is full. The crowd as told by the press next day was around 45000!!!! Saturday, March 17, 2007, 8:05 pm – Its dark, the lights come on, the Palace Ground is packed. The fans are ready for what they came here for… IRON MAIDEN is on stage and with a brief intro music followed by the intro riff of A Different World (also the opening song in the latest album A Matter Of Life & Death) the band has set fire to the stage. All of a sudden the crowd goes mad, there is a huge rush, pushes from here and there and before we know what hit us, the good view of the stage we had, is completely gone! All we can see is a sea of heads and raised hands in front of us! There is nothing that we can do about this, so we stand and we hear and we try to look at the stage. I am 5’11” and I somehow get to see the band but Rajesh and I guess another 80% of the crowd just cannot see anything except the back of the guy standing in front of them. This was a typical Iron Maiden show pretty much similar to the DVDs we’ve seen before. Steve Harris running around the stage with his galloping bass lines following him, Bruce Dickinson jumping around while also screaming in perfect pitch, Dave Murray in a corner firing away to glory, Janick Gers bang on target with his leads, Adrian Smith with his guitar swirling antics and Nico McBrain blasting away on the drums. Bruce was on a different high and with what he mentioned between the songs, it was clear that he too did not expect such a mad fan following in India. Amongst other antics he pulled, he climbed all the way up on one of the light pillars and descended sliding down the pole like a fireman on a rescue mission. Of course the band’s core member Eddie was also present. He made his first appearance on a tank and then also walked the stage. The crowd chanting the entire song including the riffs of Fear Of The Dark was the highpoint of the show. The sound was not up to the mark at all. Roger would have done a 1000 time better job than that stupid Reynolds team. So all said and done, while I must thank Iron Maiden for making it to India, I must also mention that most of us have forcefully satisfied ourselves by claiming to have enjoyed the show just by the fact that “we were there!! !” but the feeling deep inside is that we would have really loved it if we could see the band live rather than stand and hear them live. April 7, 1995 – The Deep Purple sound check in Andheri Sports Complex, where we are among the 50-odd people present right in front of the stage, watching them perform live and then we (members of my band Pythagoras & The Right Angles) actually ended up chatting, drinking Heineken and clicking photographs with the band post sound check. Sarosh (our guitarist) also accompanied Steve Morse to the loo! How did we do it? Wizcraft, the event company was looking for volunteers and there we were. August 9, 2001 – The Scorpions concert in Palace Grounds, Bangalore where we were inside the stage enclosure through out the show and the highlight was of course Mr. Matthias Jabs personally handing me his pick!!! I must also quickly mention here that as per me, this was the best rock concert that India ever saw. …and many more I don’t recall at this point of time. Hey! Firstly, cool theme. Secondly, you lucky guy! You’ve seen such amazing concerts. Love reading your reviews – this one was just fine. Great job man! Felt like I was at the concert. good post there dude!!! i am in the states, but was very excited abt the maiden gig in blore. being from hyderabad, i thought too: ‘why not hyderabad?’ but i cud mmediately think of a zillion very viable answers….anyway, i hope the indian show organisers really learn a thing or two from the gigs in the west. i’ve been to shows ranging from metallica tributes by unknown teens to def leppard and journey gigs. and every one of them had excellent light shows and brilliant sound systems. i somehow feel indian organisers have too much of a ‘chalta hai’ attitude, not enuf enthusiasm, and not enuf know-how yet, to organise a good show. and with the rock scene in india slowly getting bigger, they shud really pull up their socks and make indian venues at least to the standards of newly popular venues like japan, seoul, etc. and yeah, I’m reaaaaaaaallllly hoping Metallica tous India too. Pearl bass drum is used throughout 20th century as a component of the drum kit in jazz, rock and related styles in orchestral music, ensemble music, concert band music and marching music. Pearl bass drum is used to mark or keep time in popular music while in marches, it is used for tempo marching to the beat of the bass. Well again, another blog out of a million blogs floating out there in the sea of cyber trash, you might think. Not quite because this is My Personal Official Blog where I have, in a microscopic way, tried to give you an insight on my life with a 'peek-a-boo' to my photographs.